After one test match in the current Investec Ashes series that gave the hosts a comfortable victory; and on the eve of the second match of five, it seemed an appropriate time to visit to the home of cricket. The Marleybone Cricket Club, more casually referred to as the MCC is an institution; older than most but not as exclusive as one might think. Yes, there is currently a twenty eight year waiting period and you do need to know existing members; but membership is open to all and not expensive when compared to a season ticket at a top flight football team. The MCC; like it’s tenant, Middlesex County Cricket Club, reside at the rather formal Lord’s Cricket Ground in St. John’s Wood. Entering the inner bastion of the Pavilion is like walking into a ‘gentleman’s club’; though in this particular club ladies are also welcome to become members. If, like me, you have not endured a prolonged wait for membership, you can visit the very heart of English and, some would say, world cricket. Although the game is now run by the International Cricket Council, the MCC still administrate the laws. Lord’s run guided tours of the ground. And depending on the day and time you choose to join the tour, almost every area is open for inspection. I attended on a non-match day. 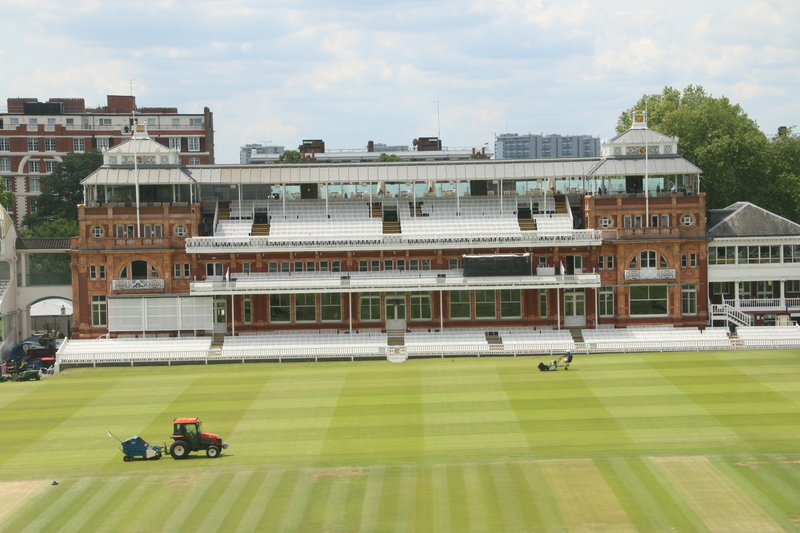 This affords the visitor the greatest chance to visit some of the iconic and oft inaccessible areas of the ground that has been the home of cricket since 1814. We met our guide at the Museum. 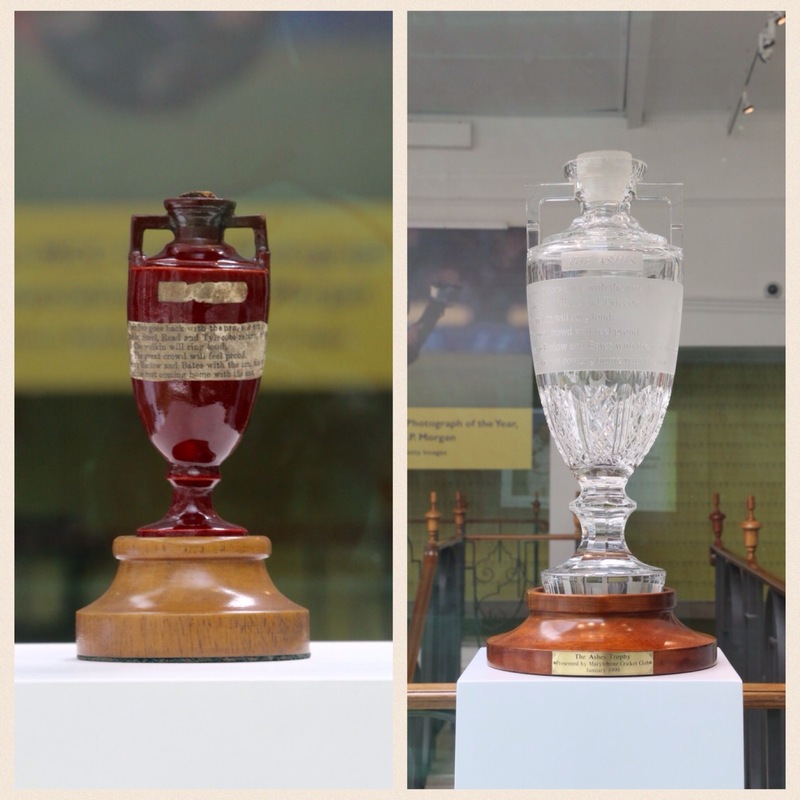 Lord’s has the largest and arguably the most valuable collection of cricket memorabilia in the world. A complete collection of Wisden Almanacs, the tome that records every score of every major match dating back 150 years. There are jackets, sweaters, shirts and caps donated by star players of past and present. Bats, balls, indeed everything. And pride of place at the top of the stairs is an insignificant looking perfume bottle presented to a former England captain, Ivo Bligh by Lady Clark and her children’s’ governess, Florence Morphy (who later married Bligh). The Ashes. The contents are a bail from a social match whilst touring Australia; not as commonly believed from an actual test match. Whilst photos exist of winning captains clasping the urn, these are replicas. The Ashes last left Lord’s in 2006-2007 when it toured Australia. Should the old enemy, aka Australia, win the trophy which they have been known to do; since 1999 they take home a ten-times larger Waterford crystal glass version of the iconic trophy. From the museum we walked to the Pavilion. Jacket and tie is the norm, but on a tour anything other than fancy dress is permitted. And the first stop is the eponymous Long Room. This elegant ballroom-esque space is where members send off and welcome back the players. Victorious home captains and players are cheered in; victorious opposition are politely applauded. However, the then un-knighted losing England captain, Ian Botham, out in both innings for a duck, was greeted on his return from the crease with silence and turned backs. Booing is not considered acceptable; though personally I would have preferred the latter indignation. The Long Room may be seen on the first tour of a match-playing day. But areas certainly off limits during match days are the stairs, changing rooms and balconies. The stairs and landing are graced with portraits of famous players, many contemporary. And each carries a story. The changing rooms are unspectacular, functional, and with two exceptions, devoid of much interest. Both ‘home’ and ‘away’ changing rooms contain an Honours Board, an inscribed list of international players who have achieved the holy grail in test cricket of scoring a century or taking five wickets in an innings or ten in a match. The other notable feature are the players and central balconies that offer wonderful views across the entire ground. At the far end of the field of play is the impressive JP Morgan sponsored media centre and nursery grounds beyond. Old Father Time, the iconic weathervane sits to the right by the Mound Stand. Having recently been relieved of its place by heavy winds, Old Father Time has now been repaired in time for the visit of the ‘green baggies’. But from the vantage spot of the balconies, what really impresses is the gradient of the famous or infamous slope that runs from left to right, a decline of about ten feet from side to side. This slope has hindered the best of bowlers over time. On from the Pavilion, we visit the only statue depicting a real person, Dr W G Grace. Grace, considered by some to have been the greatest exponent of the game, was known for his brash approach to umpires as much as his huge hitting abilities. Views of the field and wicket area are taken from the Grand Stand, followed by ascending up to the aforementioned media centre. Built in 1999, it sits facing down on to the wicket with the Pavilion as a backdrop. For the print and broadcast journalists afforded the luxury of working there, it offers a view of play second to none. On the tour we visit the lower level residence to the scribes; the upper tier reserved for broadcasters is off limits. The tour concludes with a visit to the nursery ground which is an eponymous description as this is indeed what it was back in the day, an agricultural nursery. The indoor nets are here but do not form part of the tour. There is a well stocked shop selling a range of cricket related paraphernalia including your very own Ashes urn. Such was the quality of tour and guide, I repeated the experience early on a match day. With the Pavilion off limits, a surprise was added to the tour. And this leads us back to the title, ‘It’s just not cricket…but almost’. Lord’s hosts one of the few Real Tennis courts in the country. Open to members and guests, with its own professional coach, the court is well used. You can even watch a few rallies of this mix between tennis and squash. Previous article	← Community Policing in the U.S.